Shadow Day is an opportunity for prospective juniors and seniors to test their fit as a Liberal Arts student at Georgia Tech. This event has been such a success that the College has made Shadow Day an annual event. It is produced by Elizabeth Miller, Director of Enrollment and Student Affairs, Robert Hampson, Enrollment and Student Affairs Coordinator, and the Ivan Allen Student Ambassadors. We want to emphasize that there is no other program like Shadow Day at Georgia Tech. While there are other visitation programs offered, the Shadow Day event is unique. 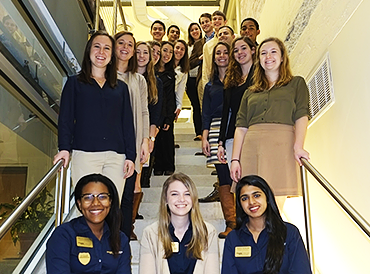 Our focus is about providing you an inside look into your major and life as a Liberal Arts student at Georgia Tech. The entire day you will be surrounded by Liberal Arts students, faculty, and staff eager to answer your questions and to make your visit as productive and worthwhile as possible. If you are traveling from out-of-state and want more than a day's worth of activities, call us and we can work with you to plan a schedule. Luncheon Rotation: assigned seats with current students, professors, and academic advisors. Are you a prospective or already admitted student? Select the "Register Now" button to the side and fill in your information. Following your registration, if you are a prospective, waitlisted, or conditional transfer student, you must pay a fee to confirm your registration, the link to which can be found on the registration page. Registration will remain open until all spaces are filled, but will close the day before each Shadow Day. If you need to cancel or switch the Shadow Day date you chose, or if you encounter any problems registering, please contact us for assistance. Parents and guardians are invited to a special one-hour Q&A with our Dean from 9:35 am to 10:35 am and also have the option of joining us for a liberal arts campus tour from 10:45 am to 11:45 am, approximately. Parents and guardians are also invited to attend the Financial Aid Session from 1:15 pm to 2:00 pm, the Meet Our Advisors: Academic Advising Panel from 2:10 pm to 3:05 pm, and either the Admissions Session with the Office of Admissions from 3:15 pm to 4:15 pm, or the Behind the Scenes: GT Athletics Tour from 3:15 pm to 4:15 pm. All other activities are for students only. A continental breakfast will also be available for you. If you need to stay on campus or in Atlanta, there are regular Georgia Tech tours that you can participate in and a wealth of activities in the Atlanta area that we can suggest for you. If you would like to participate in a Georgia Tech tour while your child attends Shadow Day, we recommend that you register for it in advance. "I am currently in the middle of my college search, and although Georgia Tech has been one of my preferred schools for some time, it wasn’t until I got the chance to experience shadow day that I became certain that it was my top choice." "One of the reasons I finally decided to come to Georgia Tech was Shadow Day. It answered a lot of my questions and I made some good friends I still have today." "I loved the whole process and the feeling of actually walking in a Tech student's shoes." "Last spring I attended IAC Shadow Day. It really stood out to me that they had a day specifically for liberal arts students. I liked that they cared enough and wanted to inform us more about the programs. I remember thinking that I would like to get involved with those people when I came to Tech." "I really enjoyed getting to speak with the current Georgia Tech students. Their honesty was very helpful in getting a feel for the college and its student body, and I hope that a year from now, I will be a Georgia Tech student myself!" "Thank you for putting together a great program on Friday. My son really enjoyed himself, and came back impressed with all that he saw and heard." "What an incredible impact the Spring Shadow Day in April of last year made on my decision to study Liberal Arts at Tech. I had actually already sent in my deposit for another school at the time and when I got accepted to Tech I doubted I would change my mind. I decided to come to the Shadow Day though, and it completely changed my mind 110%! I was totally convinced of the integrity and quality of the arts here at Tech and knew that I was meant to come here."